Driving down the narrow lane overlooking the Meon river valley with friend Peter, we had our day at Meon Springs already planned out, catch our two fish limits in the first hour, a cup of tea in the clubhouse, then down to the catch and release lakes for the rest of the day, where with the pressure off, we could try a few different methods. 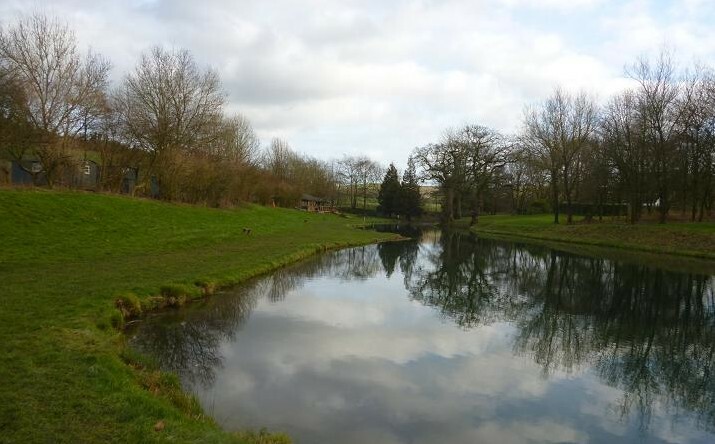 Filtered through the Hampshire chalk hillsides, the waters of the Meon are crystal clear and on this late January morning, fish could be seen moving between the weed beds, through the glass like surface. Not venturing far from the clubhouse, I started the day on the reliable old favourite Blue Flash Damsel lure, fished on a floating line, with a slow figure of eight retrieve. Peter in contrast went small with a Tiger Buzzer fished static, bumping a fish, that took on the drop, first cast. I also had a short pluck at the lure and it seemed that we would be back for that cup of tea within minutes. Oh, how the mighty fall! Twenty minutes in I’d only had a couple more plucks, while Peter was on his third fly change and also on the BFD. We made our way up toward the deeper water of the dam, hoping that presenting our lures to fresh fish wood do the trick. This worked for Peter and he was soon playing his first of the day, a sub 2lb rainbow, but apart from a few visible follows, I had yet to score. Off came the BFD and on went an ancient hand tied Black Marabou lure, one of my get out of jail tyings, the long soft feather giving life with the minimum of movement. First cast in, a take on the drop put a brief bend in the rod, before coming off. Pluck, pluck. The following casts sometimes had two trout in tow, just mouthing the marabou tail. At last the line stretched out and I was into a deep fish, Peter coming over to do the honours with the net, putting a near 3lb fish on the bank. Another angler joined us and after he had landed two fish on the trot I went over for a chat, well sign language actually, as he was from Sweden, who, in his own words had “little English”. He was using a sinking line, a short leader and a purple and gold, double hooked salmon fly. 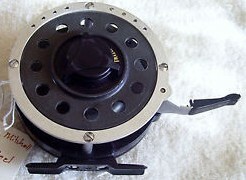 It worked well enough, the added attraction for me being his automatic Mitchell Garcia 710 fly reel, the internal clockwork spring giving and taking line with no angler input. I’ve not seen one of these heavyweights for thirty years. 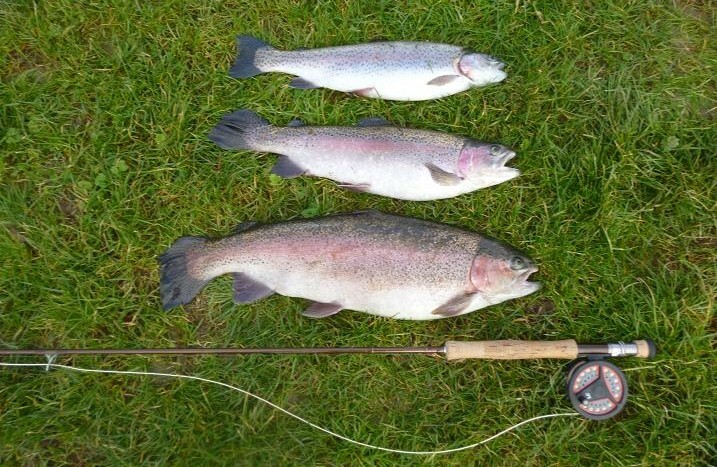 By now Peter had changed over to a blood worm three feet under a yarn indicator, which bobbed and disappeared several times to be missed on the strike, or dropped seconds later, until finally contact was made and a small rainbow made up his two fish limit. I continued thrashing the water, while Peter went to investigate the catch and release lake, my frustration growing with each tug on the line, that failed to connect. Time to change tactics. 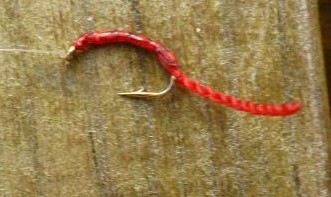 As many of my takes had been on the drop, I tied in a short length of bouyant yarn indicator four feet from a bloodworm. No sooner had the nymph begun to sink, than the indicator bobbed and skated beneath the surface. Lifting the rod in response, the rod dipped, then sprang back and I knew that the fly would be gone. Rainbows can take at such speed, that even an 8lb leader can snap like cotton. In the next half hour the indicator sank four more times, only for me to miss each strike. They were not just playing with the bloodworm, but my blood pressure too. Peter returned from his foray unimpressed, casting his line out close to mine and you guessed it, the indicator went under and he was fighting a good rainbow, banking a fish the same size as mine. Now with three fish, he returned to the clubhouse for tea and a bacon sandwich. Walking with him, I dropped off where I’d begun two hours before, casting out the bloodworm to more half hearted interest, the indicator, dipping, moving up wind and sometimes even briefly submerging, but to no avail. The bites stopped, they were bored with their new toy. The answer was another move back up the lake 50 yards. A new cast to fresh fish got a positive take. I felt the weight, then it was gone. Peter was returning, I was still on one rainbow. Back on the water, the indicator moved off toward the far side, a steady lift and I was in again. Finally! He came back in time to net my second, a well conditioned 2lb 2oz rainbow. Peter had packed up already and as we walked back to the clubhouse, I decided to have a few more casts, stopping at the original spot again. Like before the indicator was dithering about, small rings radiating out, then it began to move slowly. I lifted hard, being met by solid resistance and the sight of a big fish struggling to escape, taking line in spurts as it made off across the lake. Keeping the pressure on, this broad backed rainbow was within sight of the net several times, twice it was in the net, but Peter was unable to lift it out, before it straightened and escaped. Finally the net was under it and the monster relaxed into it enough to be lifted out. My session had been transformed in the last twenty minutes, all the frustrations of not quite hooking fish were forgotten, with this catch going on the scales at 2lb 12oz, 3lb 2oz and the largest rainbow from the fishery that day of 6lb 2oz being my biggest yet. 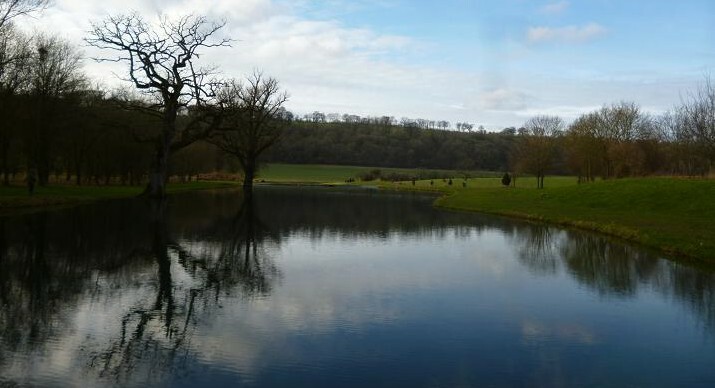 The weather was kind to us too, the first winter outing to Meon Springs, when we weren’t rained upon, or frozen into submission. Continuing waves of strong winds, rain and snow, followed by brief days of plummeting temperatures, not rising above lower single figures, have kept my outside activities down to the occasional walk to the local supermarket. The route takes me alongside a stream, which for much of it’s length, acts as a rainwater run off for the housing estate through which it runs. 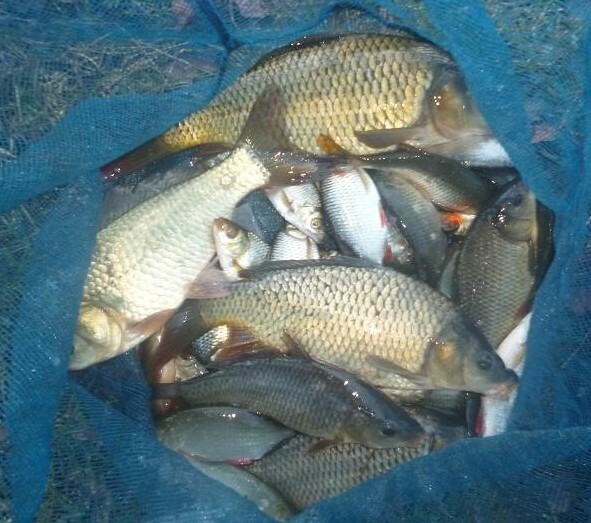 To avoid flooding, the council created balance ponds at intervals to act as overflow reservoirs and fortunately for local anglers, a fish rescue at a silted up ancient pond in a nearby nature reserve, resulted in the stocking of these shallow pools with a mixture of mostly rudd, common and crucian carp. Days of heavy rain had seen the pond doing it’s job, floodwaters spilling over from the stream to take the level beyond it’s banks close to the rugby field. 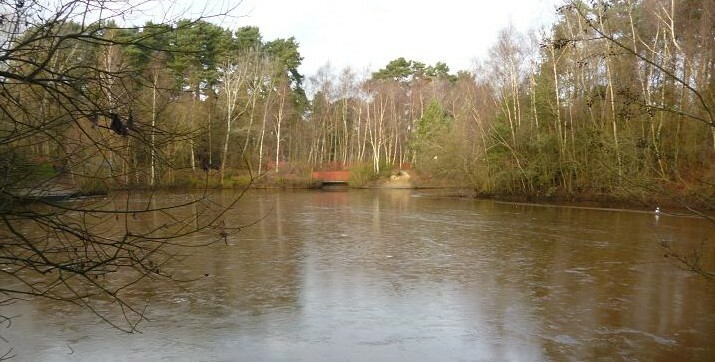 A few days later it was all change, with the level down and the margins full of cat ice following a hard frost. With worse weather to come, I decided to burn off some Christmas calories, loading up my trolley for the walk down the pond, which lies well away from any road access. In times of flood, the stream enters at one end and flows out of the other, creating a deeper channel in the silt and I set up my pole at 8 metres, with 2 metres to hand, expecting plenty of rudd during the afternoon. Red maggots from my new year outing, were turning to casters, despite chilling in the fridge and I catapulted a couple of pouches out, spraying them over an area beyond my pole. A pint of liquidised bread, mixed with handful of hempseed, also a similar amount of ground bait, was knocked together, formed into balls and scatter gunned out to spread over the baited area. A pole float, set to two feet, was punched out against the head wind and I settled down to wait for a bite. Nothing happened and I lifted out a couple of times to check that my 6 mm pellet of punched bread was still on. Ten minutes in and the float’s silhouette reduced and disappeared, swinging in a welcome rudd. Another ten minute wait, a lift of the float and I was in again to a matching rudd. At this point, a well wrapped up dog walker squeezed past my tackle box, commenting that the afternoon had turned out better than expected, “more than I can say about the fishing” I’d replied. 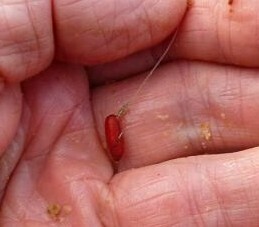 This called for another spray of ground bait, the float sliding way before it settled on the next cast. The switch was now pulled and rudd followed rudd to my keepnet, taking over thirty in the next hour, most fish hooked well down, not put off by the size 14 hook to 3lb line. 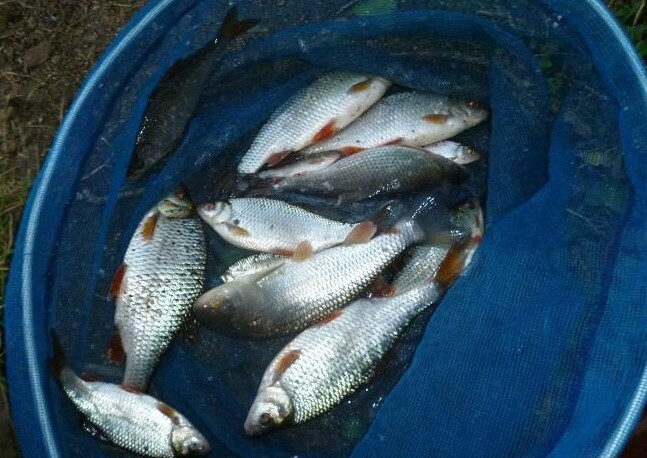 These rudd were of a good size, but I changed bait to caster to see if any better fish were around. First chuck in with the caster, the float bobbed and sailed off, the hard fighting fish zooming about unlike a rudd and I got the landing net ready for the first time, only to see a small tench break surface in front of me. I’ve yet to catch any tench larger than this from the pond, but whatever their size, they are always welcome. Back to the rudd, the following several fish, a better stamp again. I’d seen a few bubbles burst on the surface and dropped the float over one, the float dithering, before a slow sink. I lifted and the surface erupted, with a carp flapping across the surface, then charging across the pond stretching out the elastic. The runs reduced and I shipped the pole back to 2 metres and netted a near pound common. 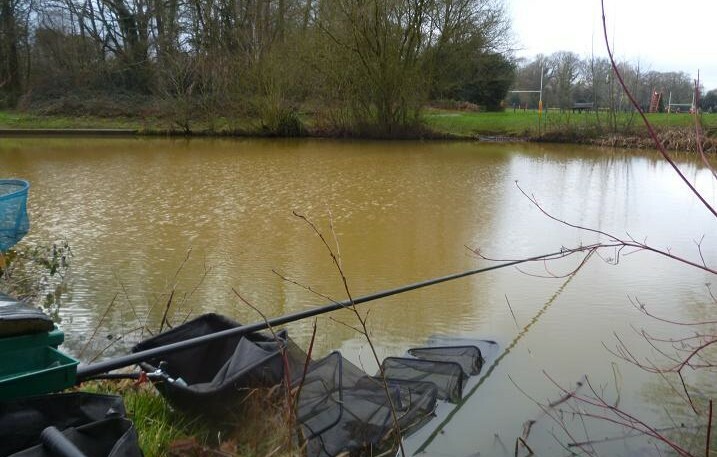 Bubbles were now appearing throughout the baited area, the rudd had done a disappearing act and various sized commons and crucian hybrids were on the feed, although the bites were the merest lift, or holds, but the hook was well down every time. 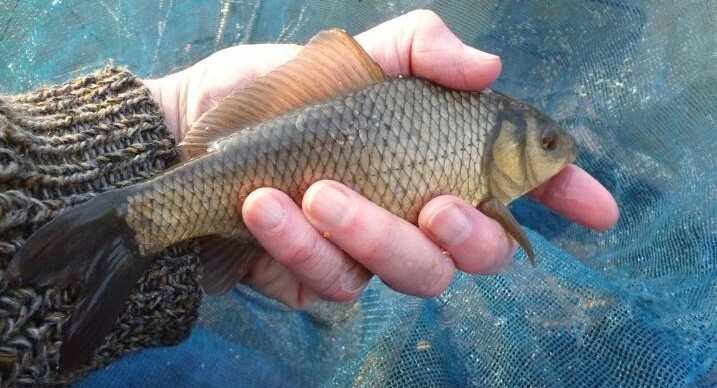 The carp’s lower lips were full of silt, a sign that they were almost static, filtering out the bait from the mud. I went back on the punch to improve the bites, but got smaller hybrids, so went back to the caster. A group containing two young families, babies in push chairs, with youngsters on scooters and trikes, now came along the narrow path and I got up to make way for them, a wheel over my carbon pole would not go down well. By the time they had scraped and clattered by, the swim had gone dead. My last portion of ground bait went in and I poured myself a long awaited hot cup of tea. I’d not had time before and the bitter wind had steadily chilled my body, but now could feel the refreshing heat working through to my stomach. The float conveniently waited for me to swallow my second cup, before bobbing in warning and then sinking. The carp were back and the elastic was out again. I’d set my time limit to 3:30, but the sun was just visible behind the trees and I’d fished on to land a couple more, when the surface exploded with a the best yet and hung on, following with my pole to ease the pull on the hook. 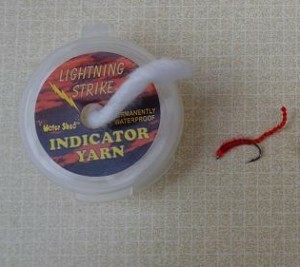 It made a run across the pond towards the tree roots, the red elastic stretching and stretching, the tension forcing the carp to turn in a reducing arc, then run again in surges. The hook hold held, only just, it was in the skin of the lip. This was the decider, the cold was creeping in again and my hands were going numb, time to pack up. The light was fading fast and flash was needed on this lively net of fish, around 10lb, in two and a half hours on a freezing winter’s afternoon, better than staying in to do the Times crossword any day. The Christmas and New Year festivities over, I was suffering from severe cabin fever, having played host to family members over the period, some in varying states of colds and flu, keeping outside activity down to a minimum, while my fishing gear was certainly off limits. A wet New Year’s Day, made way for a glorious sunny morning and the van was loaded ready for a visit to a Thames tributary not far from my home, arriving to find the river fining down, after heavy overnight rain, at midday. My intended swim is about half a mile from the road, but having reached a spot where the river takes a sharp left hand bend, I stopped, seeing this swim as if with new eyes. I usually fish the water in early autumn, before the leaves drop and this part is choked with weed, but now it was clear, beckoning me to fish it. 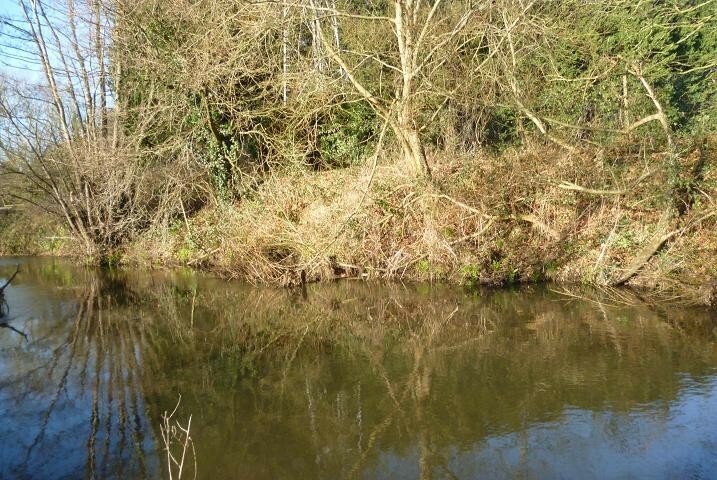 Opposite, the flow came round along the bank, washing past the remains of a willow, that looked very chubby, while a slower run went down the middle, blending into an eddy on my side. With a tree at my back, I was able to place my tackle box upstream, just out of range of it’s overhanging branches, having decided to set up my fourteen foot float rod to fish bread flake on a size 14 hook under a 6 No. 4, ali stem, bodied stick float. Plumbing the depth, there was over four feet just past middle, which ran almost to the opposite bank. Perfect for trotting a big piece of flake. I had some prefrozen slices of white medium bread, from which I tore an inch square and folded it over the hook line and pinched it on, pulling the hook back up into it. Once in the water it fluffs up and is irresistible to chub, roach and bream, especially on a cold day. Despite bright sunshine, the air temperture was about 5 degrees Centigrade, chilled by a steady northwesterly breeze. Feed was to be bread “mash”. When I was a lad, we used to fish this method under a heavy porcupine quill, the mash being created on the bank, by putting scraps of uneaten bread, saved from home, placed in an empty Hacks throat sweet tin (scrounged from the sweet shop), water added and pounded with a stick to break it up. Then the water was squeezed out and thrown into the swim in balls, sinking quickly and releasing a stream of bread along the bottom. The tin came with a screw on lid and with a string through the top sides, could be hung on the handlebars of your push bike. It also did service as a means of transporting live baits for pike fishing. Today we have food processors, which produce a coarse crumb, ideal for the Mash, but like the old days, stale bread is best and I’d saved left over rolls and French bread to run through the processor, there may have been the odd bit of turkey stuffing in there too. 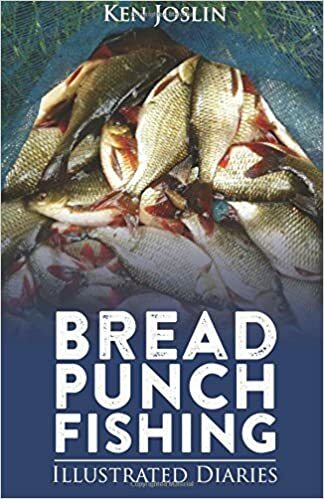 Once on the bank, just enough water was added to allow the mix to hold together, when squeezed, then the ball was thrown upstream of the deep run and I watched the bread breaking off as it fell through. This method gets me excited every time, as big fish are the target and bites are not fussy. I set the float to fish about a foot off the bottom and cast it in behind the bread ball, checking the float every foot to allow the bait to swing up, then letting it run again. Half way down the trot, the float gave a couple of sudden jabs as I held it back, then sank when released. I paused to allow the big bait to be taken in and in that moment the orange float top popped back into the sunlight, slanted over and then dived. My strike was more in shock than planned and my rod bent over into solid juddering resistance. There was an initial downstream run, which was countered with a backwind, then the pounding fight of a good roach, but no match for the 14 foot rod with 5lb main line to a 3lb hook link. That was quick, a quality roach in the net first cast. Next time in, the float carried further down the swim before again scything off towards the opposite bank. Keen to get into another fish, I lifted too soon and felt brief contact as I bumped it. On another trot, the float pulled down as I held back. I was in again, this time the zig zag run was longer, making for branches along the far bank, collecting a washing line of sunken weed stems, as it searched out the water’s edge. The white mouth and black back of a chub surfaced for seconds, before another surging run, using the pull from the shallower water at the tail of the swim to kite across to my side. With the odds of landing this fish now in my favour, I took my time netting it, being aware of a pair of dog walkers, who had stopped on the path to watch the action. Not big by chub standards, but rewarding on a cold day and the first “big” fish, that my onlookers had seen any fisherman take from the river. Once settled after the chat, I continued with no more bites, so chanced another small ball at the top of the swim and set the float 18 inches deeper to bounce the bait along the bottom, also pinching on a smaller piece of flake. The response was immediate, holding back hard, just inching the float down, gentle dips of the tip resulted in a slow submerge and another prime roach sliding into the net. A roving approach is the ideal of fishing the Mash, where it tends to seek out the bigger fish, moving on to likely lies without fear of overfeeding the swim, but I was settled on my tackle box for two, or three hours and needed to keep fish feeding for as long as possible. 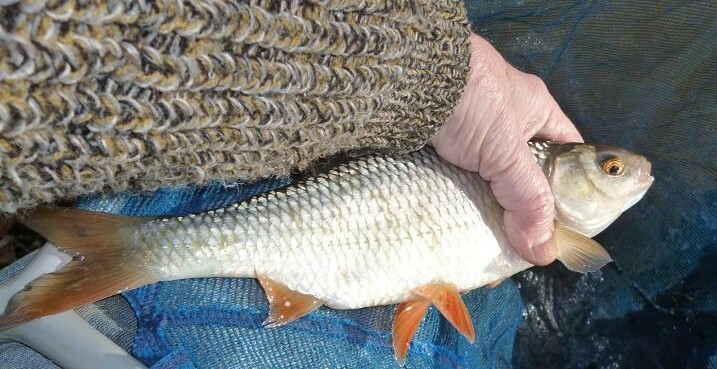 With another couple of roach in the net, the bites dried up again. Shallowing up and trotting down to the weedbed produced only one missed bite in ten minutes, even casting across to the bay opposite and letting the float skirt the dead willow drew a blank. I’d not fed any more since the chub and decided another slight change of tactics was required. 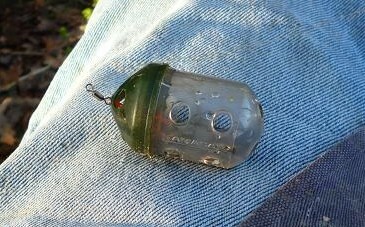 Clipping on a bait dropper, the bowl was filled with more crumb, then lowered into the swim to give a couple of light feeds, while the bread punches were brought out to scale down the bait. Punching out a 7 mm pellet, I tried running through again and fishing over depth with no results, so the last resort was to go 2 feet over depth and pull the shirt button spread of shot down to bulk, 2 feet from the hook with a No.4 and a No.8 on the tail. Resting the rod with 10 feet of line to the float, I then sat it out to wait for a bite. There were still fish in the swim and a bite developed, then stopped. The bait was gone. On about the third attempt I hooked another roach. Ah well, I’d only been there for an hour, the sun was still warm, when it appeared from the scudding clouds and I had nothing else to do. I kept picking up the odd roach. I tried red worm and red maggot. 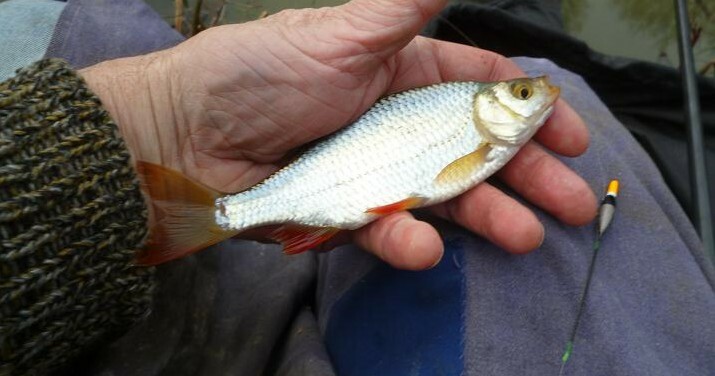 The worm got trotted all over the river with no bites, which was surprising, as the river was teaming with gudgeon and perch earlier in the year. They must have gone dormant in the cold water. After two hours all the bites had stopped and with nothing to lose, put away my float rod and made up a link leger block feeder rig. I had a quiver tip rod with me and was on the verge of packing up anyway, so thought the five minutes spent making up the rod was worth while, tying on a size 16 hook to a three foot tail to scale down again. The bay opposite was my first target, the feeder filled with more crumb and a 7 mm pellet of bread pinched on, settling beneath the roots. Watching the tip, it pulled round half an inch and flicked back. A strike and yes, a fish, another roach of a few ounces, not the big chub I expected. Nothing else came from there. I rang the changes with bait and placed the feeder in several likely looking spots, but nothing. Time to go. I’d been there for under three hours, but it seemed a lot longer. With that thought in my mind, the rod top bent round steadily and I was playing a fish. A worm tail had done it’s job. A perch? No, another nice roach had swallowed the worm, hooking it’self. This was the last fish of the day, another fat roach, the payoff for persistence. The river was now clear, having lost the brown tinge of earlier, maybe the cause of the slowdown in bites. 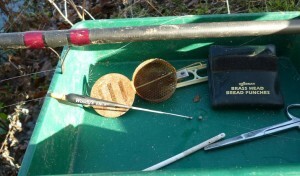 As I pulled out my keep net, it was full of silt to prove a point. A lone chub among a respectable net of roach was the outcome of a crisp, bright winter’s day, when it was a joy to be on the bank, a group of mallards benefiting from my surplus bread, while the highlight was to witness a sparrow hawk tumbling through a whirling flock of sparrows, as it tried in vain to catch one. By the time my trolley was loaded, the sun was behind the trees and there was a chilling wind gusting through the bare branches. Perfect timing. 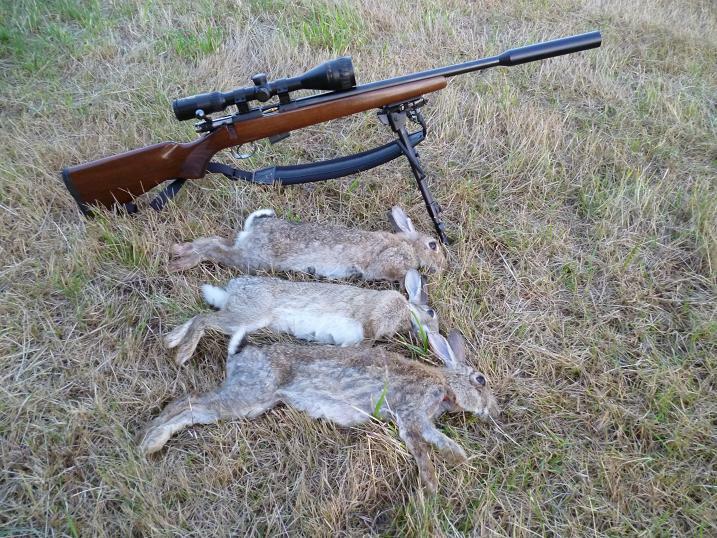 CZ452 HMR Festive rabbit hunt ends with a damp squib. With the rivers flooded and lakes frozen, fishing had to take a back seat as the days were counting down to Christmas, heading 30 miles north into South Buckinghamshire to a farm neglected by me this year, not having visited since the spring. Although totaling 90 acres, over the years of shooting, I’ve managed to restrict the rabbit population to a small copse that borders the land. Each year the rabbits spread along the hedge line, only for my .17 HMR to knock them back into the woods, where I have no access. In days past, there were several large warrens and it was worth the fuel money to harvest the abundant rabbits on regular visits, a neighbouring property owner once complaining that it sounded like the Wild West whenever I turned up, but these days, courtesy visits are the name of the game. Driving into the yard, I parked up and waited in the van, as the three farm dogs came rushing round the corner; there is a mild natured German Shepherd, but the other two are black hounds of mixed heritage with severe social problems, one of which caused me to make a hospital visit for a few stitches, a couple of years back. The farmer emerged from the pig shed and called the dogs off, coming over for a chat, while I unloaded the rifle, saying that he’d seen a dozen rabbits in the top field, plus a previously cleared area now had a few bobbing about. I apologised for the lack of attention to his land and promised to start at the top, then drive over to the other side to have a look at the other area. It’s a half mile, uphill walk to the top field, the farm cresting the Chiltern Hills and I made a bee-line for the highest point, which gives a clear view over 300 yards of the hedgerow, crawling the last 50 yards to keep my outline low on the horizon. Setting the tripod on the rifle, a quick scan through the scope revealed at least six rabbits feeding on the lush grass at the base of the trees, while more were almost invisible in the dead grass. I readied my spare five shot magazine, as once I began shooting, even at over a hundred yards away, the rabbits would soon get the message, that it was not going to be too healthy to stick around. The first couple toppled over two seconds apart, the third lifted it’s head into the cross hairs and jumped three feet vertically, running in the air. I brought the sights onto the fourth and “click-pop”, the bullet had misfired. Smoke was coming from the breech, but not from the muzzle. I withdrew the bolt to reveal the cartridge case, still partly full of powder. Taking out the bolt, the bullet was still in the bore. Game over. In the field there is no way of knocking the bullet out. This was going to be embarrassing, having happened on one of my recent visits to this very farm. These tiny .17 bullets are notorious for this, the necking down process on the .22 magnum case to .17 causing work hardening and splitting of the cases at that point. The crack allows damp to enter the cartridge and so causes a misfire, hence the term damp squibs. I’d changed from Remington bullets due to misfires and two bullets stuck in the bores and was now using Hornady, which in the previous few hundred rounds had fired perfectly, although cracks had been visible on some cases, after they had been fired. Making short work of gathering up and cleaning the rabbits. I headed back to be met with “You were quick. Run out of bullets?” When I told him the problem, I got “Again! You want to get a new rifle mate!” These farmers are a hard bunch. With tail firmly between my legs, I drove over to the other side of the farm to observe another half dozen rabbits feeding undisturbed, where there were none last year. Big slap on the wrist. Must do better. The butcher was happy to take these three, even at Christmas, people like to have a different dish on the table, wild rabbit has been promoted from humble to exotic fare these days. The next morning was spent in my shed knocking the bullet out through the barrel, it only having travelled two inches up the bore. Using plenty of gun oil down the bore, I have three lengths of 5/32 dia brass rod, which I protect with PTFE tape to avoid any damage. Fortunately my shed houses a well equipped workshop, with a kitchen worktop bench and a good quality vice to cover most needs. This was a simple case of sitting down cradling the rifle and taking my time, the bullet only moving about 0.010 of an inch per tap. I have a radio and a heater, what is there to rush over. A couple of hours later it was out, fortunately the boat tail blunt end resisted any spreading. The split can be clearly seen on the right hand spent case, while the unfired cartridge on the left has a hair line crack from the bullet to the neck. 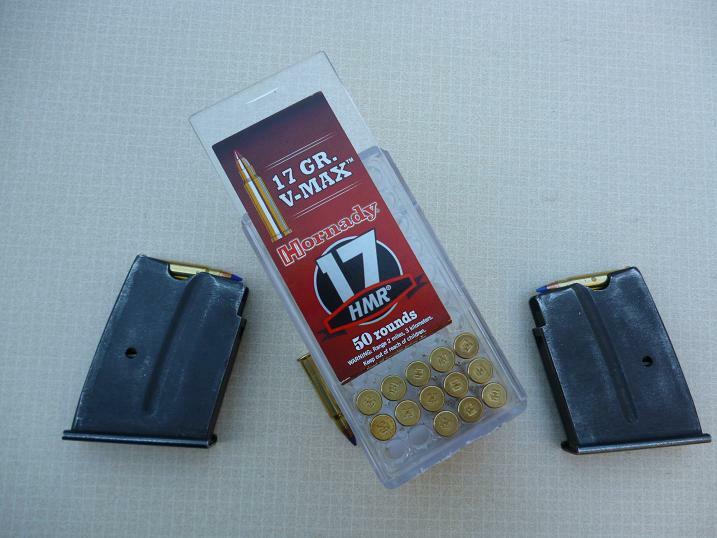 This has been a blow to my confidence in using the original Hornady .17 HMR bullets and will inspect all rounds for cracks, before I take them out in the field. Having checked twenty fired cartridge cases in my shooting jacket, three had cracks, that totals to 15%, unacceptable in a commercial product, that has been in use for over ten years.